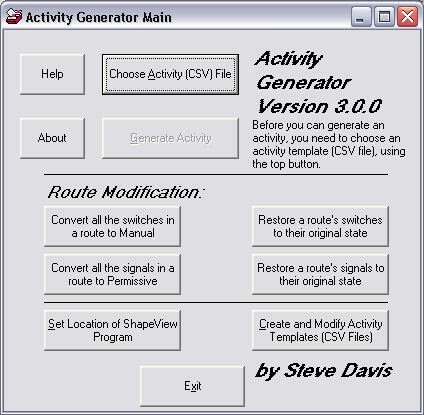 Activity Generator enables you to quickly and easily create your own freight activities for Microsoft Train SimulatorTM, with switching, WITHOUT using (or even learning) the MSTS Activity Editor, for all routes for which Activity Creation Templates have been created (see our templates page). If you have a route and would like to see a template for it, please go to the "Activity Templates" section of our User Forum and let us know. Thinking about trying Activity Generator but not sure? Click here to see a video showing how to generate/create activities using Activity Generator to see if this program is right for you. See this and other streaming video tutorials on our Video Tutorials page. We have also developed free, streaming tutorial videos to walk users through this process. See the Video Tutorials page. More are being created continually, so check the page often for updates! What's new? Click here for a pdf overview. Please see Patches and Updates.